Socialism, Marxism & Communism are variations on the same ideology. Basically: •	Government ownership of means of production •	No private property •	Redistribution ("From each according to his ability, to each according to his needs") •	Leadership by elites or dictator. Marxism is the political and economic theories of Karl Marx and Friedrich Engels, in which the concept of class struggle in the current order of society stems from its economic system, capitalism; that in this system there are two major social classes; that conflict between these two classes is the root of all problems in society. The underlying principle: "From each according to his ability, to each according to his needs". In practice, it often leads to violence since, according to Marx, a revolution is necessary in order to smash capitalism and proceed to the following stage. It also advocates for a proletariat dictatorship after the revolution to fight back any counter-revolution from the recently fallen bourgeoisie (capitalists). All Marxist forms of government in the past 150 years have been oppressive on it's citizens and as a result have failed! Because of this, today, radical leftist are taught to use the term 'socialism' and to make the point that socialism works in Norway, Sweden, Denmark and others. Conveniently misrepresenting the situations in those countries and leaving out Cuba, Venezuela, et al. Museum - "... protect beliefs that are core to Mia ..."
CORTEZ: Why was the bank involved in the caging of children and financing the caging of children to begin with? SLOAN: Uh, I — I don’t know how to answer that question because we weren’t. RUSH: All right. ... Where does this even come from? ... This comes from the Drive-By Media! .... So after that answer from Timothy Sloan, the CEO of Wells Fargo, Alexandria Ocasio-Cortez bore in even further… CORTEZ: So in finance… (stuttering) You’ve… You were financing — involved in debt financing of the CoreCivic and GEO Group, correct? SLOAN: For a period of time, we were involved in financing one of the firms. We’re not anymore in the other. I’m not familiar with the specific, uh, assertion that you’re making, but we weren’t directly involved in that. CORTEZ: Okay. So these companies run, umm, private detention facilities run by ICE which, uhh — which is involved in caging children. But I’ll — I’ll move on. RUSH: Okay. So here… Folks, I mean, look… Because some outfit uses Wells Fargo as their bank, little AOC here believes that Wells Fargo’s responsible for whatever the company does! So the CEO denies that they were “caging children.” I don’t even think she wrote they these questions. I think somebody wrote the questions for her. She’s stuttering her way through them. There aren’t any follow-ups here because she doesn’t even know enough to follow up. RUSH: As for Alexandria Ocasio-Cortez, you know, we can sit here and chuckle, and I meant to make this point. She’s sitting here with the CEO of Wells Fargo, “Why are you participating in the caging of children?” The CEO says, “What? I… I…” This is part of an ongoing campaign by the left to eventually pressure banks not to lend money to people the left doesn’t like, such as anybody that has anything to do with selling or manufacturing guns. They have already commenced this kind of program, and her question basically was laying down a marker. She also asked a question about the Dakota pipeline. (paraphrased exchange) “Why would you why would you invest in a pipeline when it leaks, when it leaks oil and destroys the environment? Why would you want that?” (sputtering) “We have nothing to do with it. We financed it. We have nothing to do with whether it leaks or not!” the CEO said. But the same marker. “We don’t think you should have financed the Dakota pipeline because it’s gonna destroy the planet,” and the CEO says, “I don’t want this grief anymore.” So they simply refuse to finance anything that might get them in trouble with the left. This is Stalinist. This is exactly what their agenda is. Make no mistake about it. 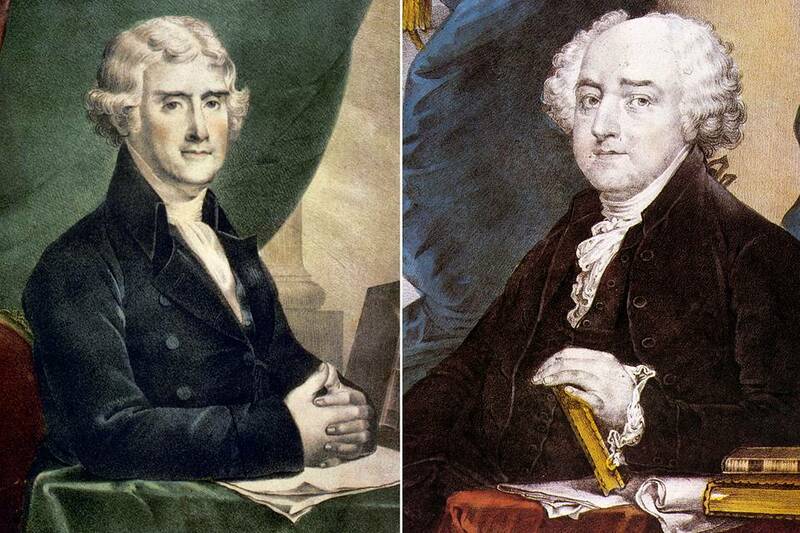 A recent Wall Street Journal article, The Founding Liberal and the Founding Conservative, by Gordon S. Wood, offers insight into how Thomas Jefferson and John Adams bridged the political divide between them in later years of their lives. Mr. Wood appropriately states how this could be a lesson for us today on how we can reconcile the country's current political divide. Our history is full of political divides, one leading into war, others to divisive political maneuvering or more appropriately, to normal adult debate of the facts. Not sure where our current divide will lead. It could go anywhere from here. So, Mr. Wood's attempt to offer a model for reconciliation is certainly needed. While I support the effort at historical reconciliation models, liberals and conservatives of today are different than liberals and conservatives of our past. Elements of both ideologies permeate today's political divide. And, as the Founders ideologies were impacted by the Enlightenment, today's political divides take input from our founding principles, from our 200+ years of experience and from principles of other political ideologies, i.e., Marxism, that have been introduced over this period since our founding. How these impacts to our founding ideas have morphed over the years in our political parties are another lesson for today's politics. To highlight a few of these areas of liberal and conservative ideological change, below are several quotes taken from Mr. Wood's article with comment about their liberal/conservative position today. In [Jefferson's] attitude toward government, he didn’t resemble a modern liberal. He believed in minimal government, which was the progressive position at the time. Instead of the strong fiscal-military state that Alexander Hamilton and other Federalists wanted, Jefferson sought only “a wise and frugal government,” as he said in his inaugural address as president—one that kept its citizens from injuring one another but otherwise left them “free to regulate their own pursuits of industry and improvement.” Mr. Jefferson espoused then, what is now a 21st century conservative position. In addition, the conservative position has added the "peace through strength" of Mr. Adams. Modern liberal philosophy now includes the Marxist view of a large government, providing equality, basic needs and services for all citizens. "Freedom to regulate their own pursuits of industry and improvement", however, is no longer the job of the citizen, but is the large government's responsibility. [Jefferson] believed literally in what he wrote in the Declaration of Independence, that all men are created equal (in his case, only all white men) The parenthetical comment here about 'only .. white men' is a tip of the hat to the politically correct culture of today. The true perspective on Jefferson and most of the Founding Fathers is that they took the lead in changing the slavery discussion while living within it. It is so easy to shout for change in a situation that has no impact on your life. It is a much more heroic effort to do this when the change you espouse is also a situation that is going to directly impact you. Setting up the Declaration of Independence and Constitution the way they did, purposely lead to the eventual abolition of slavery in America. Recognizing this, instead of attacking people 242 years ago for living the life of their times, is the more enlightened view of our Founders on this and all our issues today. Like other liberals, Jefferson was optimistic and confident of the future. This is the opposite of liberals today. An optimistic attitude represents the conservative position. America, [Jefferson] said, was “a chosen country” and “the world’s best hope.” Jefferson invented the idea of American exceptionalism. American Exceptionalism is a conservative principle today. Adams was anything but a Ronald Reagan -type conservative. He had a sour and cynical view of human nature. He was pessimistic about the future ... There was, he said, no special providence for the United States. This cynical, pessimistic view characterizes today's liberals. And, the statement that people in other countries probably think they are exceptional too, is a foundational principle of liberals today. Adams was the ultimate realist. Realism, reason and truth are all up for debate today. The first step to our reconciliation will be a joint acceptance of truth and reality over desire and ideology. In contrast to Jefferson, Adams didn’t disparage big government, but he did fear the unrestrained power of government. ... He thought that sooner or later America’s elections would become so partisan and so corrupt that we would have to turn to having officeholders serve for life. Eventually, Adams said, we would have to make the president and the Senate hereditary. Fortunately, neither party has publicly pushed this position. After Franklin Roosevelt (D) ignored George Washington's precedent of only two terms as President, Congress made it law. Conservatives today want term limits for all politicians. Liberals, want censure and in some cases criminal penalties for views that are in opposition to theirs. Mr. Wood sums up this history lesson well for us. Although James Madison could never understand what his closest friend Jefferson saw in Adams, Jefferson realized that Adams was a man of “rigorous honesty” and realistic judgment. Jefferson claimed that under Adams’s crusty surface, the irascible Yankee was as warm and amiable as a person could be. Jefferson tolerated better than most Adams’s facetious and teasing manner. They knew that their combination of idealism and realism had helped create the country, and that realization was enough to sustain the revival of their friendship. It is a good lesson for our constitutional government, in any age.